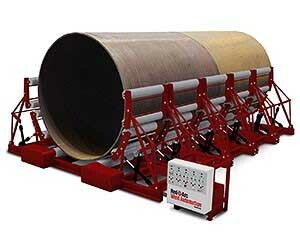 Red-D-Arc’s MFUB-TW Modular Fit Up Bed system is specially designed for the construction of thin-wall tanks ranging in size from 10′ to 15′-6″ in diameter. 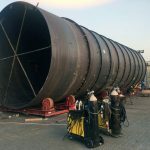 Our patented system is fitted with independently-adjustable vertical-rolls to support, align and compensate for tank non-concentricity when assembling multiple thin-wall sections. There is no need for spider bracing as the system will keep the cans concentric during fit-up and welding. 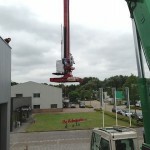 Each system is supplied with a Motorized Drive Unit (MDU) module connected to up to four Coupled Connection Drive (CCD) modules – depending on the length and number of sections to be joined. The CCD modules are connected to the MDU module by splice couplings and fish-plates at each side of the skid frame so that the wheel drums on all the modules are driven. 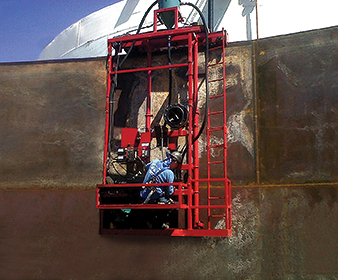 The system is flexible enough to accommodate various lengths and sections of tanks. The MDU is driven on both wheel drums through a double-reduction heavy-duty worm and wheel gearbox with chain and sprocket through an AC vectored motor. 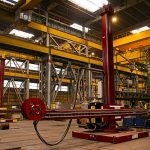 Each MDU and CCD module is fitted with 4 hydraulic-support-arms (upper link and lower link assemblies) giving 4 points of contact on each side of the work piece along the length of the fabricated tank. Once the tank section is lowered into position on the wheel drums, the support arms, which independently pivot, are moved into position to manipulate the shape of the tank sidewalls. After the tank sections have been welded together, the support arms – which are independently controlled through a solenoid-operated push-button station controlled via hydraulic power pack – can be disengaged and the tank can be removed.